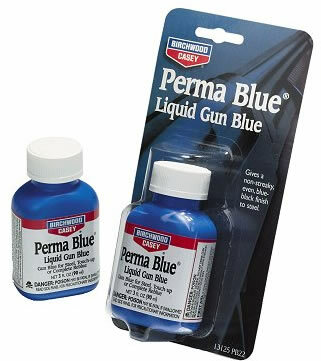 Perma Blue Liquid Gun Blue, is the proven way to touch up scratches and worn spots or to completely re-blue most guns. It will give a non streaky, even blue black finish to steel (except stainless). All parts to be blued must be thoroughly cleaned with a metal cleaner such as Birchwood Casey's liquid or aerosol cleaner/degreaser and any rust must be removed before applying the blue.